La Biennale di Venezia marks an important milestone in its long history by awarding the United Arab Emirates, the first Gulf Nation to participate in the International Art Exhibition and Architecture Biennale, with a long-term hospitality agreement (permanent pavilion) in the Arsenale—Sale d’Armi. The new space will showcase visual arts and architecture from the Emirates. This commitment offers myriad opportunities for the UAE cultural scene to span art, architecture, film, dance, music, and theatre and ensure that UAE artists are presented at the forefront of international contemporary art. Currently 30 out of the 86 National Participations (official figures, 2011) are housed in permanent pavilions. Building on the success of its acclaimed editions of the National Pavilion at the 53rd and 54th International Art Exhibitions, the National Pavilion of the UAE focuses the nation’s international artistic programming on promoting and empowering Emirati artists, while at the same time providing a foundation to support the nation’s diverse and established art scene. The 2013 National Pavilion of the UAE at the 55th International Art Exhibition – la Biennale di Venezia features a solo presentation by Emirati artist Mohammed Kazem in Walking on Water, an exhibition curated by Reem Fadda, Associate Curator for Middle Eastern Art at the Guggenheim – Abu Dhabi Project. Walking on Water presents Directions 2005/2013, a specially commissioned, immersive installation conceived in 2005 and realized for this exhibition. It is part of Kazem’s most emblematic series, Directions, a conceptual project that the artist began in 1999 and has continued to develop through various multimedia installations and photographic series. 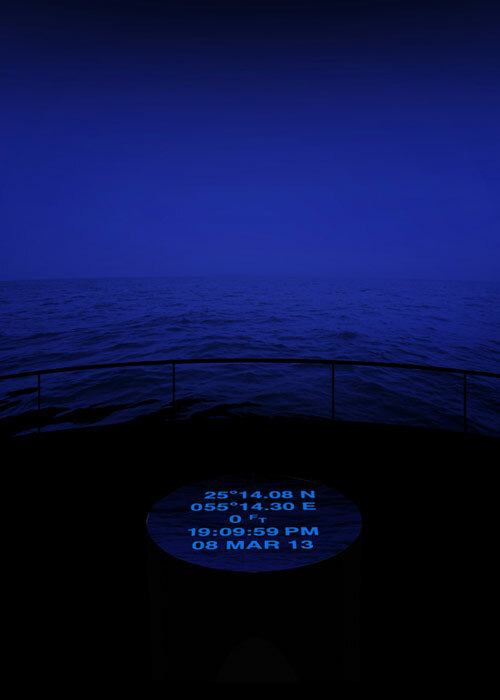 Comprised of a 360-degree projection of the sea and illuminated interchangeable GPS coordinates within an enclosed chamber, the artwork engages viewers in a seascape that invites them to experience what it is to be lost at sea, to walk the waters unafraid, to cross physical barriers, and to roam the borders of ideas freely, thereby questioning and challenging their perceptions of openness and universality. A major publication on the artist’s practice from the 1980s to present day accompanies the exhibition, featuring essays by Reem Fadda, Paulina Kolczynska, Hassan Sharif, Sultan Al Qassemi and Adel Khozam. Designed by Fikra, published by the National Pavilion for the United Arab Emirates and printed by Damiani (Bologna, Italy). Kazem’s works have been selected for biennials and exhibitions around the world for over two decades, including Moscow, Holland, Singapore, Japan, Egypt, India, Germany, and Cuba. He has taken part in several editions of the Sharjah International Art Biennial, where he was awarded first prize for installation (1999 and 2003). Kazem went on to curate the 8th Sharjah Biennial in 2007. Since then, he was the curator of The Flying House from 2007 to 2011, while simultaneously curating exhibitions in Spain, Switzerland, and in the UAE. His works have been collected by private and public institutions, such as Deutsche Bank, JP Morgan Chase, Foundation Louis Vuitton, MATHAF Doha, and Sharjah Art Foundation. The National Pavilion of the United Arab Emirates for 2013 has been made possible through the generous support of the Sheikha Salama bint Hamdan Al Nahyan Foundation and the Ministry of Culture, Youth and Community Development. Fikra produced the design of the monograph and exhibition collaterals. Melanie Taylor is the exhibition designer. Image is a work Mohammed Kazem, “Directions 2005/2013,” 2005/2013. Color video installation, with sound, two-minuteloop, overall dimensions variable. Courtesy of the UAE National Pavilion.